We all love food, right? Gone are the days when ‘cooking’ meant pouring boiling water into a plastic pot of delicious noodles. (You’re still doing that? Oh.) Today, thanks to the slew of celeb chefs and TV shows like Masterchef (avocado lime cheesecake anyone? ), our tastes are way more sophisticated. So it’s hardly surprising that there’s been a boom in cookery classes across the UK. Event company, Red Letter Days, say cookery courses are among their most popular gifts. Here are five of the weirdest/ coolest ones around. These are the cutest things we’ve ever seen. Lemongrass and ginger flavour? Watermelon? Gin and Tonic flavour? 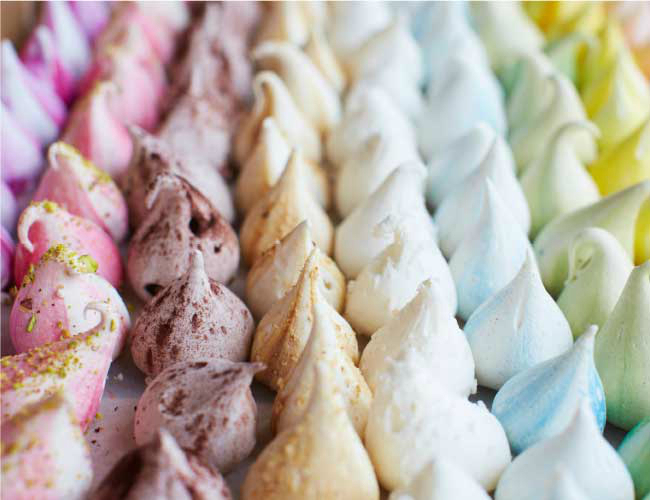 Sip a glass of prosecco and learn how to mix, flavour and create these little heavenly delights. Then take them home with you. Or scoff the lot and don’t tell anyone. Okay, so any veggies reading this turn away now. You know those days when you find yourself with a whole pig carcass and just don’t know what to do with it? This class will show you. Butchery classes are crazy-popular right now, especially among those who want more control over their food and to know its provenance. You’ll learn about the animal, its breeding, how to ‘break down’ a carcass, and finally take cuts away with you to cook at home. Oh, stop fussing – we told you to turn away. Okay, so they supply the goat. But you’ll get to ‘deal with’ the milk curd, hang it, salt it and finally roll it. Then you get a picnic lunch and to take some of your cheese home. Or you could eat it on the train (guaranteed to get you a seat). Make it from scratch, roll and cut tagliatelle, stuff some ravioli, create some lovely sauces and impress the hell out of everyone you know. Pasta-making is fairly easy once you have the skills. Only problem is you’ll want to eat pasta every night now. Pass the parmesan. Grazie. A veggie course for outdoorsy types, you’ll forage, prepare, cook and eat from ‘nature’s larder’ (not an actual larder, people). If your idea of fun is digging around outdoors then cooking up what you find in a clay oven, this is for you. Summer courses use the hedgerow blossoms to make savouries, drinks and sweets. And in autumn there are fruits, berries, nuts and fungi to stuff your face with. There’s also time to sit around a campfire and read. Now that, we can get on board with.